Well, I haven't written in a few days because I've actually been very productive. I knew that I didn't have any appointments or anything that was necessary to get done from Tuesday through Thursday this week, so I actually "scheduled" some time (pretty much the whole day on each of those days) to finally get all my digital photos and videos organized. It probably doesn't sound like a big deal, but it literally took me two and a half days from the time I dropped my kids off at school until late each evening. I had 33,000 photos and 3,000 videos in several places on my computer, an external hard drive, and some flash drives. The worst part is that a ton of my photos had duplicates--some with three or four! I tried using programs in the past to get rid of duplicates, but it never worked very well. And then every time I would transfer photos from one spot to another, the dates would get screwed up in the metadata. The whole point is that my photos were a HUGE JUMBLED MESS. I knew it would take me several days to work on them, which is why I actually scheduled the time to do it. In the end (this afternoon), I managed to delete 13,000 duplicate photos, and nearly 2,000 duplicate videos! I used a program called shootShifter to change the dates of each photo back to the original EXIF date stamped into the photo. A lot of the dates were STILL incorrect, because I had lots of scanned photos (so a photo from 2002, for example, would read 2011, because I scanned it in 2011). Also, when I had my old camera (not my phone), I would regularly forget to set the date, and a had thousands of photos labeled 1/1/2004 (the default date). So overwhelming! But, I have to say, I am in a VERY good place mentally right now, and I'm able to focus on tasks like never before. I absolutely cannot believe the change since starting my medications for bipolar. My mood has been great, I'm very patient, I can stay focused on one task for a long time (like these last three days!) and I don't get irritated or anxious. My house has stayed the cleanest it's ever been, because I actually don't mind doing "chores". I find that I look forward to my routines--the morning when I get the kids ready for school and I make all the beds, and start a load of laundry. Throughout the day, I clean things as needed. Before bed, I have a routine of cleaning the kitchen counters and sink, putting away the laundry, cleaning out the litter box, and then sitting down with the family. I've been missing out on this "normalcy" for so long! But, I am not going to focus on that. Instead, I'm just enjoying feeling "normal" for the first time in my life. As I was waiting for uploads and downloads through the last few days, I managed to clear out my inbox, which also gets overwhelming at times. And I've gotten lots of emails recently about my psych appointment and bipolar diagnosis (all very kind emails and comments--thank you all for being so nice!). Several people said they felt compelled to finally make an appointment themselves, which I think is awesome! It was very hard for me to make the initial appointment (actually, Jerry did all the calling for me, because it was usually when I was in a deep depression). 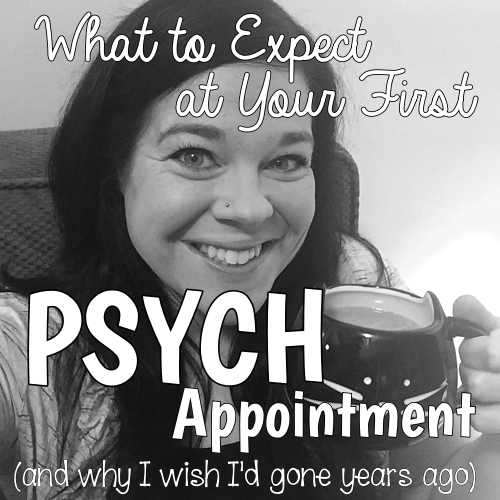 So, I thought I would write a little about what to expect at that first psychiatrist appointment. A psychiatrist is actually a medical doctor who specializes in diagnosing and treating mental illness. This differs from a therapist, because the psychiatrist doesn't typically do therapy--they diagnose mental illnesses, prescribe medications, and/or refer patients to therapy, or other forms of treatment. I've been going to therapy for a year and a half now--I didn't care for the first therapist, so I switched to a different one and I absolutely LOVE her. She's amazing, and I've learned so much from her. She suspected I had bipolar, and she mentioned it a few times to me, but I dismissed it so quickly that she stopped trying. But, she did recommend that I see a psychiatrist, because nothing I'd tried was helping me to get better. As I mentioned here, I tried for MONTHS to get in to see a psychiatrist. My usual health system wasn't taking any new psych patients at all--I didn't even know that they were allowed to turn away people! I tried getting in to another health system, and was put on a nine month waiting list. One day, I was having such a bad day that Jerry started going through doctors online and calling several until he found one that had an appointment about five months out, which was the soonest I could get in anywhere. Ridiculous, right? So, he made the appointment, and I waited, feeling desperate. Meanwhile, my general practitioner was helping by prescribing antidepressants, in the hopes that we could find one that worked. He also suspected bipolar, and recommended I see a psychiatrist, but I insisted that it was depression. I just hoped that the psychiatrist would know a combination of meds or something that could help. As I was reading about medications online (trying to find things to suggest to my doctor), I started to think that maybe I had inattentive ADHD. I had a lot of the symptoms for it, and I became convinced that I had both that and depression. In March, about four months after scheduling the psych appointment, I got a phone call from the psychiatrist's office saying that they'd had a cancellation, and they could get me in the next day. I jumped at the chance--I didn't care what I had going on, I would make SURE to go to that appointment. I knew going in that what I wanted was a proper diagnosis (I suspected depression and inattentive ADHD) and treatment (medication that would actually work for me, in addition to my therapy). However, I did not want the doctor to have any preconceived notions about my diagnosis. If I told him that I had previous been diagnosed with depression, or if I just said that I have depression and anxiety and I need help for it, he might not dig further into the problem. So, I specifically didn't offer that information (at first). After filling out forms, I was surprised that they took my blood pressure and weight. But, considering I was seeing a medical doctor who prescribes medication, I guess it makes sense that they do that. I sat in the waiting room for about 20 minutes filling out papers, and then the doctor came out to get me. I followed him to his office, which looked nothing like a typical doctor's exam room--it didn't have medical supplies or a bed/table with the long strip of paper on it, or anything like that. It just had a desk, a large book shelf, a few chairs, etc. It looked like a home office, basically. I sat across from the doctor at the desk, and he asked me what I was hoping to get out of the appointment. Instead of saying, "Oh, I have depression and anxiety, and I really need help for that," or something, I simply said that I had been on antidepressants for a long time, but they just weren't working--I was still having uncomfortable symptoms (to put it lightly), and I wanted a proper diagnosis and treatment. He started asking me a trillion questions. Since he is not a therapist, I gave him the answers he needed for diagnosis, but didn't go on and on about issues in my life--I save that for therapy :) He asked me about my family's medical history, about my own history, about medications I've taken in the past, what symptoms I was having, when they started occurring, the severity of them, and about a thousand other things. The questions were easy enough to answer factually without getting emotional (I only got teary once or twice, and that was when talking about the severity of my depression this past year). The appointment lasted about an hour and fifteen minutes. Toward the end, I did mention that 10 years ago, a psychiatrist diagnosed me as bipolar, and "how crazy is that?!" I joked. He smiled and said I probably wouldn't like his diagnosis, then--because his diagnosis was bipolar as well. At first, I thought, "Ugh--here we go again." However, I had already decided, prior to the appointment, that I was going to try whatever the doctor suggested. I was so desperate going in there that I would entertain any idea! I started asking him questions--basically challenging his diagnosis, because I still didn't understand how I could be bipolar. For the first time in the last 10 years, I finally got a real explanation. He described the two different types of bipolar disorder, and said I likely had type II (I explained a little about that on this post). Anyway, after he explained about bipolar, and why the antidepressants weren't working for me (in fact, they may have been making me worse), he explained that he would prescribe a mood stabilizer. This would keep me from getting hypomanic and from getting depressed--I would hopefully settle somewhere in the middle, like a "normal" person. He sent in the prescriptions electronically right while I was sitting there, and I took my first dose that evening. Within about four days, I started noticing a difference in my mood. And the longer I've been on the medication, the better I've been feeling. I'm not euphoric, but I'm not depressed, either. The medication is doing exactly what it's supposed to do, and I couldn't be more thrilled that something is finally working. So, I wrote this to basically give an idea of what to expect at a first psychiatry appointment. Of course, it may be different for other patients and/or doctors; but thankfully, I really like my doctor and I could tell he knows his stuff. I was happy that I didn't feel rushed, and he spent a good amount of time with me. When making an appointment, I would ask how long the first appointments typically last. If they say anything less than an hour, I would keep looking. There are a lot of factors to look at when diagnosing mental illness, and I think it would be impossible in a 30-minute appointment. Also, I would suggest asking for a diagnosis, rather than telling the doctor what you think you have. Once we put an idea in someone's head, they won't be able to dismiss that idea when considering a diagnosis. And, of course, be as honest as possible when answering questions. I wouldn't try to make the severity of the symptoms sound worse in the hope that the doctor will take you more seriously. Even the smallest details help with the diagnosis. For example, the fact that my depression started at around age 9 or 10 was very significant for a bipolar diagnosis--I had no idea until he explained that to me later. Many psychiatrists work hand-in-hand with therapists as well, and my doctor has therapists at his office. If I hadn't already gotten established with a therapist that I love, then that would be part of his treatment plan as well. I really enjoy my therapy sessions, and the one that I had just before my psych appointment was when I FINALLY had that "aha!" moment. I always wondered what caused my depression (which I now know is actually bipolar). I won't get into the details, because it's pretty personal, but the discovery has changed my life significantly. I decided to stop living like I was constantly on edge and worried about doing something "wrong". I stopped feeling guilty all the time for reasons I couldn't explain. There were things that nagged at me for years because I tried to avoid conflict as much as possible--and finally, I am able to take care of issues in the moment, instead of always feeling worried about them. I've been able to say things that may not be what others want to hear, but I'm truthful. I stopped avoiding certain topics or issues for fear of conflict, and it feels freeing. I've started saying "sorry" only when I've actually done something that is worth apologizing for; before, I apologized for everything just to "keep the peace". I mentioned on my post a few days ago that I am now saying "yes" to more invitations with friends and family--because I am eager to establish or develop better relationships with them, as well as step out of the comfort zone that I had grown so accustomed to. However, I am also saying "no" to things as well--things that truly don't interest me. I used to do things that I didn't enjoy--again, to avoid conflict. I feel like I am finally taking care of myself, and it's amazing. I owe this to lots of therapy sessions and the correct diagnosis and medication. Thanks so much for reading about all of my ups and downs over the last six years! haha. Things in my life are changing quite a bit, and I'm feeling good about it. (I am still looking into rebranding my blog--it's very overwhelming, but it is definitely on my "to do" list.) With all of these changes in my personal life, I think the timing is great for a change in my blog as well. Love your honesty and thank you for sharing! I'm so happy to hear how good you're doing!! Glad things are going well!! Thank you so much Katie for all of your honest posts I have loved reading of late and keeping up with your progress. I myself suffer from anxiety and depression, as does my husband. I just yesterday learned about and signed up for this virtual 10K event supporting mental illness and I wanted to share with you and all your readers! 1in5marathonrelay.com. Check it out! You know I've been reading you for a loonnngg time (all the way back to S.P.) so I was aware of your ups/downs with depression, binges and struggles but until this post I don't think I knew the severity of the problem. Your honesty in approaching this and all things on the blog are so inspiring and so, so helpful to others struggling with whatever whether it's to lose weight, seek out therapy, adopt a pet or make a fabulous pot of soup--you are my go-to resource girl! This post makes me so happy because the relief and normalcy you're (finally) feeling comes across my screen and straight to my heart! All these years, right... I can only imagine what you'll accomplish now that you're "normal" ;~) ha-ha of course, that's tongue-in-cheek, because, really who's normal?! Hugs to you and the boys and wishing you a great weekend! Thank you, Janet! I've always been pretty good at hiding the severity of it, especially in my writing. It's not that I felt ashamed, but that I felt guilty for feeling this way when I have such a great life that I "shouldn't" have anything to feel depressed or anxious about it! Your comment is so kind--I'm so glad that you've gotten so much out of my blog. And yes, feeling "normal" (I always put that in quotes, because you're right--what is "normal"?!) is so nice. I am thrilled that my treatment is finally working! The Chris Cornell suicide has me wondering if recent medication he had been taking for anxiety made a previous mental illness (like biploar) worse which led to his seemingly inexplicable suicide. So VERY glad you found something that works and are feeling so much better. Thank you! I was so sad to read about Chris Cornell. I always feel bad when I read about suicide--hopelessness is an awful feeling, and you're right--the wrong medications could have done more harm than good. And in my case, the antidepressants were certainly doing more harm! I'm so glad that I (finally) accepted the new diagnosis and got the correct treatment. Lucas is a adorable. So fun to be a proud aunt. I'm a grandma four times over with the fifth due in October. I love being Grandma and cannot wait for #5. Loved your detailed description of what you went through trying to get help, and it worries me. What about those who are truly on the edge, and need help immediately? Do they too have to wait six months? That six months might be the different in life and death for them and that is scary and unacceptable. I am so happy you seem to have found some answers for yourself, with new medication and in talking to the new psychiatrist. I always read about people discovering what it was in their past that made them overweight today, and almost wished I could discover something like that about myself. Like you, my childhood was happy, nothing out of the ordinary, no abuse or neglect. And yet I overeat. I guess I've just finally come to the conclusion that I love to eat. Perhaps what was missing from my childhood (when I was not significantly overweight, at least not until my pre-teen years), was something that brought me as much joy as food does. My family fulfills me and I need to focus on that pleasure and not so much that momentary pleasure I get from eating a bunch of sweet carbs. I saw a therapist two years ago. My son's marriage was breaking up (they have since gotten back together and built a beautiful new home--I have high hopes for their future), and I had never really come to terms with my husband's terminal cancer diagnosis, and all of a sudden it was just all too much for me to handle. The University where we both worked before retirement offers free counseling to employees and their families, so for the first time in my over 37 years there, I took advantage of it. I only went twice. It wasn't much help. When I mentioned how I was fighting a re-gain of a significant weight loss, all he wanted to talk about was how fit and skinny his own wife was. I think the first thing a therapist needs to learn is that the session is about the person who has come to him/her for help, not about him/her or his/her family. Sometimes I feel stretched in so many directions. I am the caregiver in so many situations, taking care of my sons (and daughter-sin-law) when they are experiencing difficulties, babysitting the grandkids, taking care of hubs, and although my parents are gone now, my father-in-law recently lost his second wife and will be visiting more frequently. Even at the age of 89, he doesn't really require much "care," but when he's here, I do have to make sure meals are on time and company-worthy, which isn't always the case when it's just hubs and me. Sometimes (when I'm in a self-pitying mood)I wonder WHO is taking care of me? And I thought the therapy session would be all about ME. I know it's selfish, but we all need that sometimes. And now here I go, on YOUR blog about getting help for YOU, talking about ME. I do that all the time when commenting on your blog. I apologize. So let me finish by getting back to YOU, and complimenting you on seeking out help (even if it took longer than you wanted) and getting some answers, and finally feeling more normal. I'm looking forward to reading more about your adventures in life in whatever you decide to call your blog. I am hooked! I promise you not all therapists are like that. You are able to search until you find someone that is a good fit for you. So don't give up there is a provider out there for you who can help. I loved this post! We're in the process of getting my teenage daughter in to see a psychiatrist, so this was very helpful! I'm so glad I could help! Feel free to email me if you have any questions. Thanks for sharing so honestly. And congratulations on finding a medicine that makes you feel good for the first time in so long! Thank you for being so open about your mental health journey! I am glad it is becoming more acceptable for people to talk about. I have been a reader of yours for many years and you have been such an inspiration for me to work towards being healthy. Especially, since I have also received a life altering diagnosis this year. I was diagnosed in February, at the age of 27, with Fibromyalgia and Postural Orthostatic Tachycardia Syndrome. So to see you have your up and down days has been so helpful. You have shown me that everyone will have up and down days but in the end we aren't alone in this struggle. So thank you for sharing your life through this blog. Both the ups and the downs are extremely helpful to us the reader. I am so glad you were able to find a good therapist and psychiatrist in your area. I know it is quite difficult to do so nowadays. I work at a combination Inpatient/Outpatient Behavioral Health floor at my city's hospital. I work with some of the most amazing, passionate psychiatrists, therapists, nurses and psychologists. They have shown me the level of care that each person should and deserves to receive. Which has motivated me to pursue my Masters in Counseling and I graduate May 2018. Unfortunately, there is a shortage of these providers across the US. Due to the length of schooling, the inadequate pay, and the fact that this only recently is becoming an acceptable field of medicine. Even where I live we have to send people an hour or more away because we do not have enough providers. Our inpatient/outpatient practices are full to the brim and we get constant request from new patients. Its a difficult balance to keep and provide the best care possible to the surrounding communities. We can and sadly do have turn people away due to the fact that our providers are booked out for months at at time in the outpatient side. Though our inpatient side is constantly able to help those in crisis. But we really try to work with providers in surrounding cities so there are no gaps in people's care. For your readers who are new to mental health or trying to find providers I have some tips to help navigate their or loved ones care. Get a list of providers from your insurance. (Though know that these are not always up to date!) If you are unable to find someone covered contact your insurance and let them know! They may work with you to find another provider who they may be willing to cover if no one in network is accepting patients. Or they may begin to reach out themselves to help you. Sometimes in between your appointment (which can be far out) your normal family care doctor will help with some medications or can assist you in finding another provider. Everyone's insurance will cover mental health services. So get to know your insurance! By calling your insurance or having someone help (like your family care doctor's office) it will sort out any stressful worries about what kind of services and providers you are allowed to see. Also, at every insurance they have case workers. These people are here for you! They are advocates for you working through your mental health journey. I have worked with many in different insurance companies that bend over backwards to make sure you get the appropriate care. If in doubt ask a health care professional. Whether that be your normal doctor or any other provider. If anything they can put you in contact with someone who knows more than they do. As a last resort the emergency room at your nearest hospital will help! So please don't feel like you are alone. They can refill medications if you are in-between doctors and your appointment is really far out. Also, if you are in crisis at anytime please have someone tak you there. They will help you always! There is always someone available to talk with you! So please never feel like you are alone! A crisis line for the entire US that is there 24/7 is 1-800-273-8255.